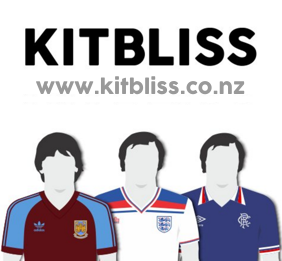 It’s not uncommon to associate certain football shirts with a winning period in a team’s history – Argentina in 1986 or Manchester United in 1993, for instance – but association with a particular player is an overlooked phenomenon that happens almost as often. In the case of Newcastle United’s home shirt for 1993-1995, it will always (for me at least) be associated with one player and one player alone – Alan Shearer. Not that a single player can elevate a shirt to greatness single-handedly. It just so happens that this one came completely out of the blue and was unlike so many others in its design. What sealed its place in the memories of so many, however, was when it appeared on the wiry frame of the world’s most expensive player when presented to Newcastle fans in 1996. But let’s put Alan Shearer to one side for a moment (or as long as I can stretch this article out for, at the very least). This shirt, produced by adidas in 1995, was a vision of sublime simplicity. Its main feature was a white grandad collar which, without the aid of any other complementary elements, was enough to get the football kit design fraternity into something of a tizz. To put this into perspective, hardly any other shirt before it had dared to implement a grandad collar in the entire history of British football. The only other one that springs to mind was also made by adidas and also appeared in 1995 in the form of Liverpool’s green and white quartered away shirt. Newcastle United’s version had a long hem containing three buttons up to the neckline, and again it’s worth mentioning that, along with the collar, it was white. That’s because all of Newcastle’s shirts since the late-1960’s had featured a collar that was either completely black or had some form of black trim. This one was all the better for being completely colourless and set the tone for understated style that permeated the rest of the garment. The black and white stripes were also on show, as you’d expect, and the width of those stripes were absolutely spot on in my view. 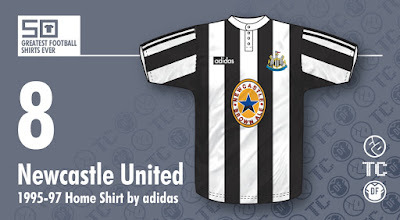 They were wide enough to frame not only the Newcastle badge – still just seven years on from its introduction – but also the manufacturer’s logo in name form only, set on its own black strip. As a final flourish, the iconic three stripes of adidas also made an appearance, but in reverence to the club and its history, they started and finished only on the arms rather than extending to the shoulders and neck. 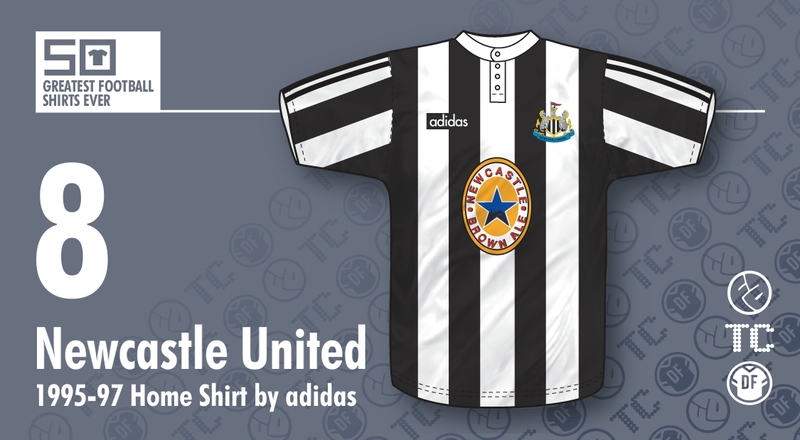 Throw in an all-new Newcastle Breweries logo to replace the old blue star from previous seasons and you have an excellent shirt that took pride of place among many other great alternatives for the St James’ Park club during the 1990’s. Looking every bit as smart on Alan Shearer’s back as it did on your own, this was another great example of how ingenuity at the design stage can make for a truly stand-out football shirt. Written by Chris Oakley (The Football Attic). This shirt is part of The 50 Greatest Football Shirts Ever. The full list can be viewed here. 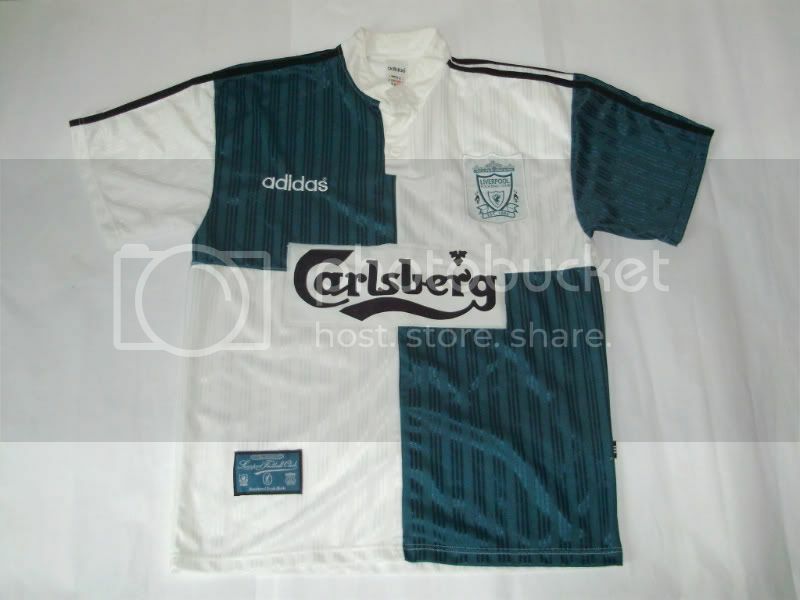 The Liverpool quartered shirt with the grandad collar came out in 1995, the same year as this one. Totally agree - I love this shirt and would have made number 1. You didn't mention the material that seemed to have a nicer and more substantial feel than other shirts from same era. However, wouldn't you say that some Umbro shirts from 87 ish such as England and Man City away featured grandad type collars? The England etc shirts, while round and buttoned, were slightly different from the Newcastle one, which was much more like a dress shirt. Beauty personified! adidas's best striped shirt ever. Replacing a black stripe on the sleeve with the 3 stripes was genius. Nowadays they'd cram the stripes onto a contrasting coloured stripe. Internal voice: "Say stripe again, I dare you, I double dare you"
This blog site is now closed. We no longer update the content within it, nor are we creating new material for it. 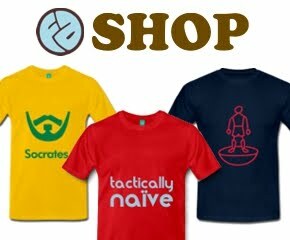 If you are a third party wishing to write an article for The Football Attic in exchange for self-promotion, we politely decline all requests in light of the previous statement. 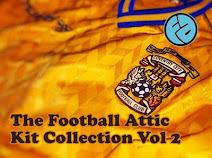 Kit Collection Book - Last 4! Click here for a random Attic blog post!